Heights Heroes is pleased to announce their First Donation! While not flashy (or even serviceable . 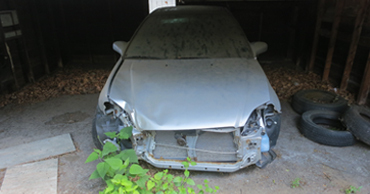 . .) the proper disposal of this abandoned car eliminated a nuisance for the new owner and generated funds for the Foundation. The success of this effort will open the door to other situations where cars that have been abandoned can be removed, recycled and provide funds for Heroes! If you have an abandoned car or truck, call us. We can help. Another example of how working together, we can make our world safer and better.